By default, Mac OS X saves screenshots—images you take of your Mac’s screen—to your Desktop folder in PDF (in 10.5) or PNG (in 10.4 and 10.6) format. Back in 2005, I covered three utilities for changing these settings, choosing EGO Systems’ Screenshots Preference Pane as my favorite over cf/x’s Savescreenie and Bruce Phillips’ Screenshot Settings, mainly because Screenshots Preference Pane let you easily choose both a different format and a different location for saved screenshots. Savescreenie offered only the former feature, and Screenshot Settings’ interface wasn’t as nice. Thanks to our friends over at TidBITS, I learned that Savescreenie was recently updated, and the new version, Savescreenie 2, offers more features, works well with the latest versions of OS X, and is easier to use. It’s become my utility of choice for changing OS X’s built-in screenshot settings. 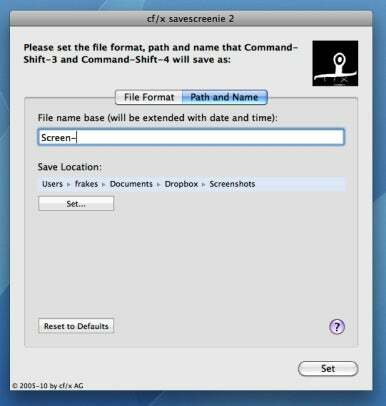 After choosing the desired format, click on the Path and Name button, and you can edit the location where OS X saves screenshots. For example, when writing articles, I tend to take screenshots on multiple computers, so to be sure I can access those screenshots on any of my Macs, I’ve set the Save Location for OS X screenshots to a folder called Screenshots inside my Dropbox folder. Whenever I take a screenshot on any of my Macs, that image is automatically synced to all my Macs. You can also use the Path and Name screen to change the base name of screenshots. By default, Snow Leopard names screenshots with the base name of Screen shot, followed by the date and time. Using Savescreenie, you can change that base name (but not the date and time suffix or format). Mac OS X 10.5 instead saves files using the format Picture #, where # is the lowest number not already used in the destination folder. In either case, changing the base name to, say, SS will result in much shorter screenshot names. When you’re done making changes, click the Set button, which edits OS X’s screenshot preferences and then restarts the system service responsible for handling screenshots. As part of this process, you’ll see any Menu Extras—those icons on the right-hand side of the menu bar—disappear and then reappear. This is normal. Unlike older versions of Savescreenie, version 2 includes an excellent PDF manual, accessible by clicking the Help (?) icon. In addition to documenting Savescreenie’s features, the manual includes the Terminal commands the program uses to perform its magic. 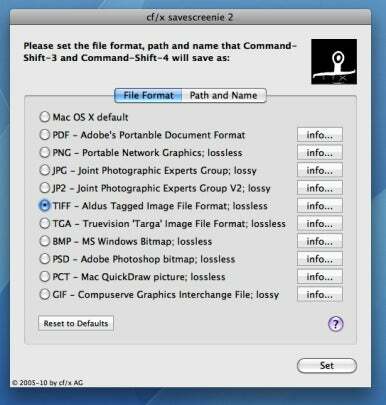 Note that Snow Leopard (10.6) doesn’t support PICT (PCT) format for screenshots. Savescreenie will let you change the screenshot format to PICT under Snow Leopard, but when you try to take a screenshot, OS X will display an error. The solution is simply to switch the screenshot format back to one of the other options, though it would be useful if Savescreenie actually prevented you from setting the format to PICT under 10.6. Command+Shift+3: Takes a full-screen screenshot. Command+Shift+4: Gives you a crosshair for selecting a specific screenshot area. Command+Shift+4, then Spacebar: Gives you a “camera” for capturing a specific on-screen object—just click the desired object. Adding the Control key to any of these combinations copies the resulting screenshot to the Clipboard instead of saving the screenshot as a file. You can then open your favorite graphics program—or even OS X’s own Preview program—and paste the screenshot into a new or existing document. While choosing a screen area in crosshair (Command+Shift+4) mode, holding down Spacebar lets you move the selected area without changing its size; and holding down Shift lets you change the size of the selected area along only one axis—horizontal or vertical—shrinking or enlarging the selection by moving only the side under the cursor. Holding down Shift+Option also resizes along only one axis, but changes the selection size by the same amount on both sides.